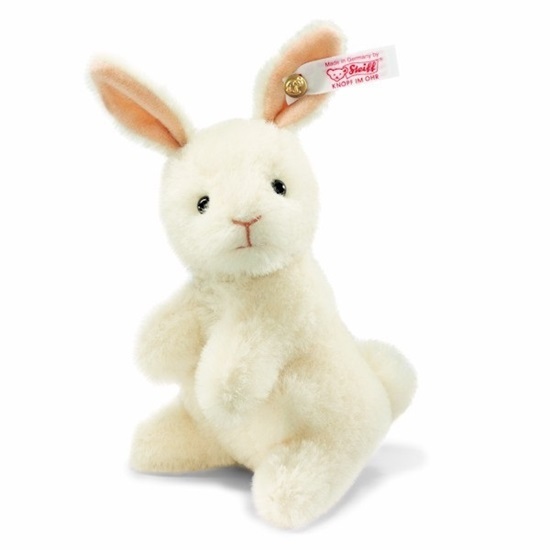 She is made from white alpaca and stands at 4 inches tall..
Diva is a 4 inch tall, Limited Edition, Steiff Alpaca Bunny, and magician Frederic Chimpanzees white rabbit. Diva is one way jointed, with a turnable head, and is sewn from the most luxurious white alpaca. The colour of her hand stitched nose and mouth, matches that of her inner ears perfectly, and resting in one, she has her 110th Anniversary - Elephant - Button in the Ear. Diva is a delightful, Worldwide Limited Edition of 1,500 pieces, and comes boxed with her certificate of authenticity.